"He would be able to follow his mind into its secret places. This portrait would be to him the most magical of mirrors. As it had revealed to him his own body, so it would reveal to him his own soul." With eyes that know the darkness in my soul"
"Beneath the social mask we wear every day, we have a hidden shadow side: an impulsive, wounded, sad, or isolated part that we generally try to ignore." Initially i deliberately didn't add my voice with explanations but just wanted the image and quotes to resonate (or not) with each viewer and each viewing. But Gary's questions and conjectures had me thinking, and before long, writing. The painting is not a whimsy but born of a troubled few years and chronically disturbed dreams since my mother's death. Anyway, i take myself far too seriously to be able to enjoy a mere whimsy, haha. Made from stuff lying around my studio? For sure! This work belongs to my research into expressive mark-making. I see two prime routes to expressive mark-making. One is to leave a trace of your handling of materials so that your character or emotions register and are preserved in the paint. This usually requires some kind of impasto. Vigor or lethargy, doodling or purposefulness, rage or melancholy are as trapped in the paint surface as a bug in amber. The second route however, is to set up media to do their work, giving agency to the paint and solvents, enlisting gravity and capillary action, oozings and drippings, mixings and repellings. As i mentioned in an earlier discussion, Heidegger's concept of "at hand" materials is very salient to working in this way. Happen-chance, synchronicity, my material environment and the history of that environment, remnants of my past endeavours, under-workings and palimpsests, all come to the aid of my semi-sighted questing for an expressive image that tells a truth. And i have been much concerned with truth - emotional truth - in my work. Which brings to mind an Australian Expressionism pioneer, Albert Tucker, who spent his life exploring the darker side of the soul. 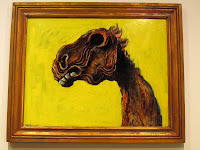 (My thanks to the Gallery of NSW who gave me permission to photograph Tucker's amazing horse). Tucker's art dealer said of one series of his works, that he dealt not in prettiness, but unsettling truths. The same could be applied to most of his life's work. "Often difficult and abrasive, the work reflects the artist's struggle to come to terms with a society he was at odds with". 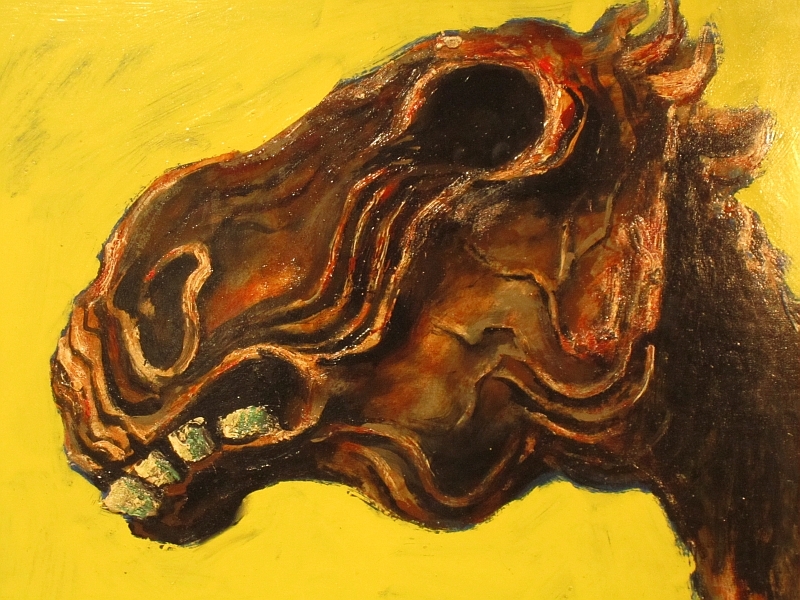 Albert Tucker, Apocalyptic Horse, 1956, (detail). In my case, i guess it is a Self i am at odds with. Because the painting is so dark and 'blotchy', it may seem formless at first glance. It may look nothing like a portrait at all and viewers might imagine i have simply entitled a black blob of asphalt a self portrait in a metaphorical way. Not so. 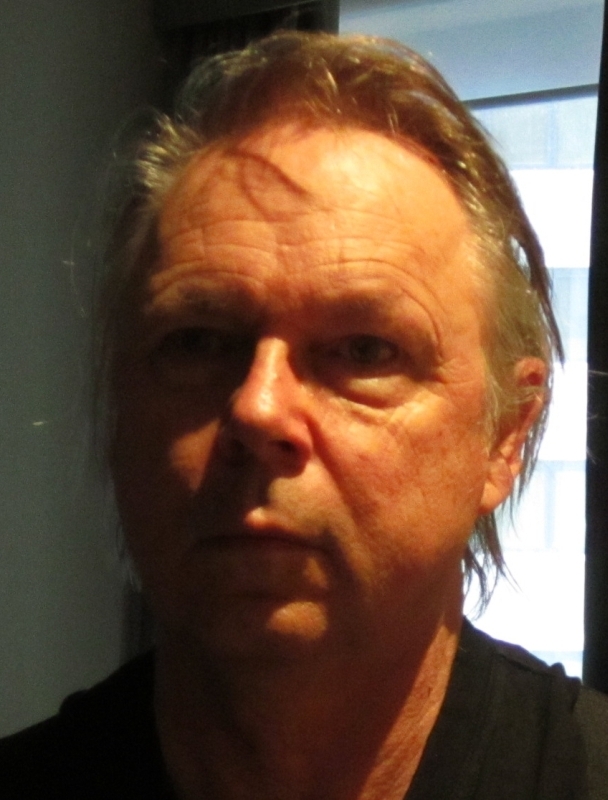 If you look with a squint you might see the left side of my face lit in the painting rather like in this recent photo. Just a word about the media, especially the bitumen. It has long been used by artists but not without criticism. Géricault's The Raft of the Medusa suffers areas that were once bitumen's velvety brown now having become an indiscernible black mass with age (Wikipedia). The Pre-Raphelite's emphasis on brilliance of colour was in reaction to the excessive use of bitumen by earlier British artists, such as Reynolds, David Wilkie and Benjamin Robert Haydon. Bitumen produces unstable areas of muddy darkness, an effect that the Pre-Raphaelites despised. On top of that, there are OH&S issues - bitumen is carcinogenic. So why have i used it? Well, in archival terms it is a durable medium, even if its brown is fugitive and turns to black. It is cheap. Very cheap compared to oil paints. It has interesting tactile properties in use, ranging from treacle-viscous to free-running stained-turps wash. Like with charcoal, images can be created by building up by applying, or created carving out by removing from a previously applied layer with a turps-dampened rag. And i like the idea that it is a reject material from passé art movements. I like the idea that is unvalued, undervalued, devalued, even shunned. I like that is not to be found in art supply shops but on the bottom shelf in hardware departments. It is a humble material. In other words, mostly i like its poetic qualities. By that i mean its direct appeal to the senses and its metaphoric associations. It stinks of Hell. It has oozed from the hidden bowels of the earth. It is the very substance of our unconscious. Qualities all apt, i believe, for the subject of this work. I admit to having no idea what prompted this sp, though I would love to know about your motivation, ideas, thought process, or even that it was merely whimsy or stuff lying about your studio. On the other hand, I guess that would kill the mystery...the magic of the work. You are the master of allowing us to figure it out...to find our own meaning or reason. I, for one, love and hate that. Though I can conceive of all sorts or imaginary things out of thin air, when it comes to interpreting what others have done...not so much. Frustration is a word which comes to mind. So, Harry, help me out. I'm handicapped by my upbringing which tells me, based upon your previous imaginative works, this is but another creative exploration utilizing new materials. Fabulous though it is, I'd love it even more if you would loose your extensive vocabulary and dazzle me with obscure references to mythology, psychology and fantasy. Oh...never mind. Let me just enjoy the mystery! You keep setting the bar ever higher and I'm still wallowing in the sand pit. I have no words to convey what I think and feel about this painting, Harry. It, and the words following it, moved me very much. Very nice "hidden shadow side!" I guess since everything we paint is really a self portrait... and extension of ourselves I can see how this is a self portrait. Otherwise...??? It is, however, as always, interesting and cause for thought and intrigue. - Thanks!! This self-portrait was worth the wait. I think the dark is the source of most great art--it allows you the discern the tiniest bit of light. This is wonderful, and after googling bitumen and styrene, I'm guessing it's waterproof, too. I'm so pleased that you're back. Harry, what a strong work to mark your return to this space! It is indeed "darkness visible," and a mirror to both your soul and the soul of anyone who dares to gaze at it with honesty. Not much more to say but wow, and thanks. Looking good! It's great to see you back. I hope all is well with you. this is a brilliant portrait..the words are stirring. I am glad you have returned. What a great set of questions, Gary! So good that they have become the basis of my adding some commentary to the quotes! So please take the added comments above as a reply to your observations. And thanks for the warmth of your response to my work. You have been so supportive and that is much appreciated, good friend. Thanks Rhonda. I feel this work is getting rather idosyncratically personal so i'm pleased it's also still able to speak to some viewers. Hi Willy in Ghent! Always great to have you visit Tassie. Thanks for the comment. Marian, so true!! One of the cornerstones of my thesis is the Renaissance saying, "Every painter paints himself" for just the reason you mention. If you look with a squint you might see the left side of my face lit in the painting rather like in the photo which i will now add to my commentary to help the viewer. Your work packs such an emotional punch that at times I have no words. You always deliver a reward for looking. I had to write down words that popped into my head as I looked at your latest self-portrait. I thought: wounded, maimed, mutilated, profound despair. Need I write more? There was a formula painter who painted on television here about 25 years and occasionally he would come up with something profound. Once he said, "Without dark, there is no light." I think that applies here. Hallie, thanks so much for the lovely comment. I haven't tried the water-proof yet, haha, but your comment on the bitumen made me add a section on the medium into my main discussion. Hi Brian. Good to be back. Hopefully now i'll get on roll, get in the groove, get into the zone, or something and produce a catch-up body of work before 2011 ends. It's how i've done most of my schooling, so it should still work out, lol. Hi Celeste. Thanks for the welcome back. What an uplifting comment, Davida! It's made my day. I was in two minds whether to even post it on my blog. In fact, i've been of two minds whether to even continue painting. I seem to fall so far short of what i aspire to. So such an affirming comment from one who is a capable judge of student work means a great deal to me. Thank you. I admire, your ability to 'squeeze' of considerable unrest life, and synthesizes them into an image so intimate. on the bitumen, I feel the same! and I loved and still love, the strong smell, so peculiar that he has! comes from the bowels of the earth. resulted in a piece, uncannily sensitive and beautiful. What a privilege, 'feel' this work! Wow! How I love reading the words of a well-educated and deeply introspective gentleman. After reading the other comments, I do feel a little like the dim-witted boy who spoke his mind. The painting probably screamed too loudly for me to hear. Thanks for opening my ears, Harry. Salule, Denise. I'm so pleased you know first hand how it is to work with bitumen! Thank you for your very generous comments about the painting. Evening, Gary. Don't encourage me or i'll just get more long-winded, shrill and arcane! If it wasn't for your prompt, i wouldn't have written anything. So you certainly did me a favour because i usually end up using what i write here in my journal for assessment at the end of my course (i don't think they are quite up to asssessing blogs yet towards an academic qualification - give em another decade or two). All I can say in my poor english is that I like this work very much. I was intrigued by the image as I came to say a thank you for your comment on my site, Harry. Before I read the quotes and your narrative, I felt the weight of emotion through this medium. It works. One can see distinctly "face". But the texture and darkeness is marvelous insofar as this computer can manifest. I am sorry for the pain of your loss, but oh, how artistry in both your words and image alongside investigation into media and history is giving it release and with such profound and moving power. I see that his art remains strong! You consguiu with the help of "bitumen"
"" Just as our body is a veritable museum of organs, each with its long historical evolution, we should also expect to find an analogous organization in our mind. Our mind could never be a product with no history in the opposite situation exists the the body! Hi Manel. It's quite different from your own work which focuses more on realism, so i'm glad you connected with it. Ah Laura, you are such a tonic! Thanks so much for the kind comments, Cathyann. Yes, it is a bit different in life. I could not prevent the reflections from the grid which misleadingly look like white lines in the photo. My mentioning my mother is a talisman, not a cause. There are other great losses that pit the soul. So this painting is really about a state of soul more than a reaction to a single event. Thanks for your sensitivity. Hi Annette. Sorry i've been out of circulation since returning from Europe. Thanks for the encouragement to persevere. You have set a great example. Brilliant news about your Master of Philosophy! Paulo, great to be in touch again. Trust you to quote Jung. Your own work is so philosophical. And still the vibrant raging color, i see! Haha, yes Rahina, we seem to be a contrary bunch. Love the powerful portrait you are currently working on! I have avoided commenting on this for so long and I have not read the previous posts from your other "fans". I really find this painting very depressing and frightening. The skill with the mediums is beautiful. The image is something that I do not want to look at for very long. Maybe this angst is exactly what you were trying to express? hi Steven. Thank you so much for your comment, a testimony to your sensitivity to image and to media. You are right to be troubled. I am troubled by this painting. This is a painting of my dark side, my Jungian Shadow, a part of Self i would rather deny exists. 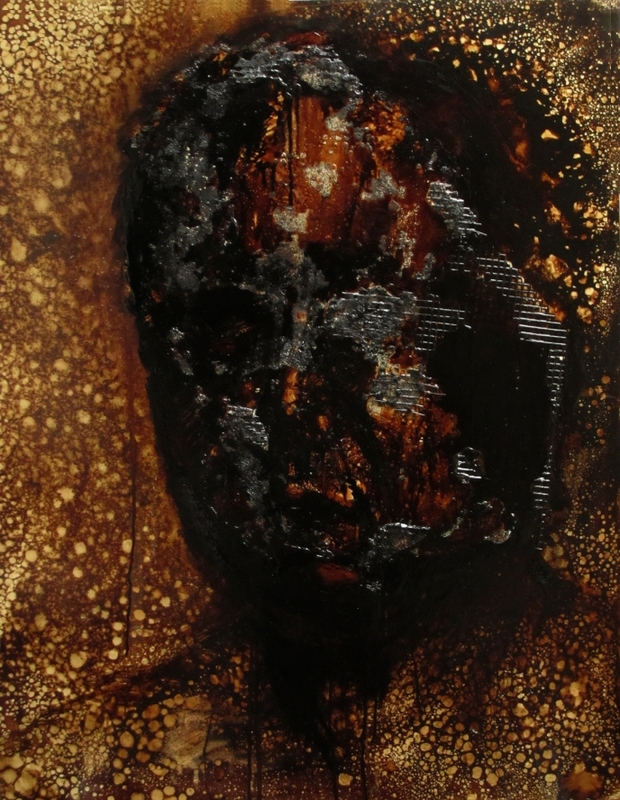 This is a self-portrait that tries to access powerful archetypal content of the Unconscious. I believe the more troubling the image is, the closer i have come to some kind of truth. As an antidote, i have recently completed my colourful Trickster in quite a different gendre. Once again, thank you for persisting with this worrying image. Thank you for your sensitive reading of the work. Have a great Christmas and New Year, my friend.